I completed my first season as a Girls on The Run (GOTR) Coach. Being a boy and a coach for GOTR is pretty rare. 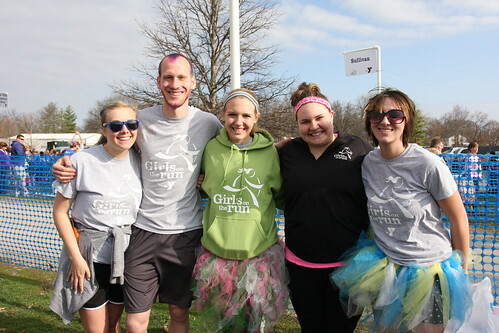 I was the only one out of about 115 coaches at the East Central Illinois branch of GOTR. Our goal is to make an impact on the girls’ lives, let them know that bullying and gossiping are bad for everyone, and that you can’t always listen to the messages the media is sending you. It’s some tough messages to for 3rd-5th graders to grasp sometimes, but they’ve surprised me. They pick up more than you think. The season ended with an awesome 5k run. Letting the girls know that if they can finish at 5k, they can do anything. Here is a good article about the event and GOTR. I wouldn’t have become a coach if it weren’t for Jen. She was my role model for coaching and is still the best coach I’ve seen. She manages to give her full energy at every lesson and is always silly for the girls (as you can see, she is wearing a chicken costume at the 5k). Even though she’s silly, she fully understands the message we are trying to send the girls, and the ways GOTR should empower them. Jen is changing the world … and after my first season as coach, I’ve feel that I have actually made a difference. I’ve seen the girls at my site grow and become more confident. It was totally worth it.